During this webinar, Dr. Lopez will demonstrate “resequencing of skills” made easy by Maple’s Clickable Math™ paradigm. Computer technology allows conceptual development to come before the acquisition of manipulative skills. Correctly used, it enhances understanding, generates greater insights, and motivates learning. The direct access to the power of Maple provided by the ease-of-use features of Clickable Math means that this more efficient pedagogy can be implemented without first having to teach a tool. Just teach the math, as Dr. Lopez will demonstrate with Maple 15. Dr. Robert J. Lopez, Emeritus Professor of Mathematics at the Rose-Hulman Institute of Technology in Terre Haute, Indiana, USA, is an award winning educator in mathematics and is the author of several books, including Advanced Engineering Mathematics. For nearly three decades, Dr. Lopez has also been a visionary figure in the introduction of math technology into undergraduate education and has received numerous awards for outstanding teaching and scholarship. 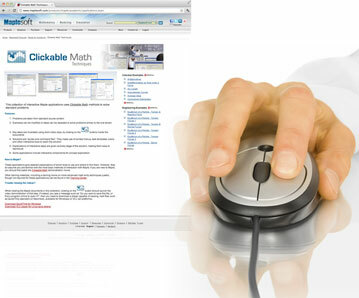 Fill out the form below to view the webinar "Redefining Math Education with Clickable Math". Ich würde gerne mehr über die neuen Maplesoft-Produkte, -Aktionen und -Sonderangebote erfahren.